Use thick paper/cardstock to make your pattern. My triangle is 6" at the top with 8 1/2" sides. Pick a good part of your map. Make sure the back is nice too. 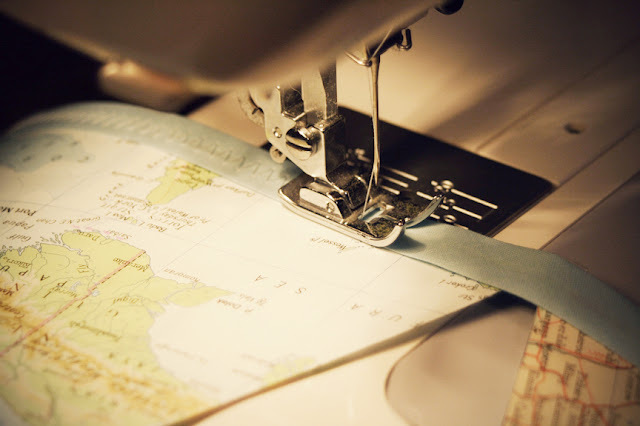 Trace your pattern and cut out your traingle. I always use a metal ruler upside down when cutting because then it will be flush with the paper. Now you should have perfect triangles. Use bias tape for the top. All I had was single fold 1/2" so I had to attach it to the front and the back of the triangles. Next time I'll buy 1" so I can just fold it over. I used double-sided tape to secure it. It's time to sew! I used a zig-zag stitch. I left about 3" of bias tape at each end. I sewed to the end of the paper, did not sew the 3", and put a few stitches at the very end. This way the bias tape forms a loop for hanging the bunting. This is so fun and creative! Would be cute for a going away party or destination wedding shower! Thanks, Julia! What a cute round-up! Hi Carla, I found a my giant atlas at a thrift store. I also need help finding maps. Can you help me? I'm not sure where to find them other than thrift stores. Maybe you could get one at a convenience store.